A whopping 94 percent of recruiters use LinkedIn, according to Jobvite’s 2014 Social Recruiting Survey. 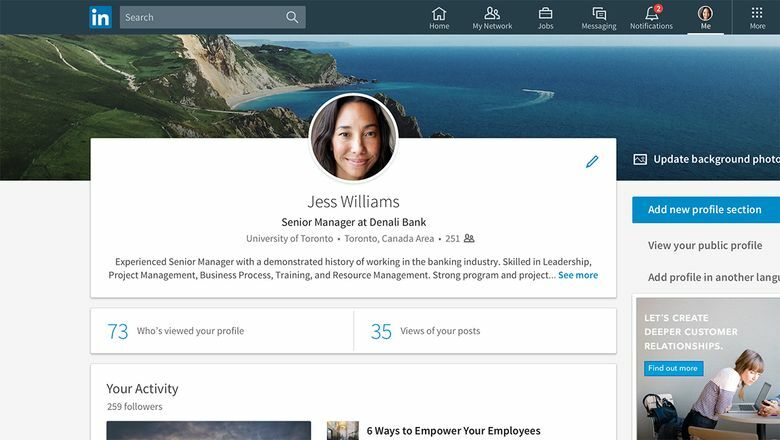 The online tool’s rise to prominence as a hub for employers and job seekers alike is unsurprising: Where a traditional résumé can be two-dimensional, LinkedIn employs features that allow candidates to stand out in a crowded marketplace. If you’re trying to get noticed — say, by a hiring manager at your dream company — the simplest thing you can do on LinkedIn is view that person’s profile, Turnbull says, because he or she will be notified that you looked. But besides your name, all they see is your photo and headline. These two things need to motivate them to click on you. “Having a photo that is professional and approachable is important,” says Tammy Perkins, chief people officer at Seattle-based marketing consultancy Fjuri. That doesn’t mean it has to be taken by a professional. It means not using a picture where it’s obvious someone next to you has been cropped out, or that epic shot on Mt. Kilimanjaro where you’re the size of the pea. Recruiters want to see your well-groomed mug. Perkins says that in viewing the volume of profiles that she does, she remembers faces before names. For the headline, go beyond listing a static job title and turn it into an active statement. Turnbull points out that in addition to stating skills, you want to emphasize benefits you bring to the table and results you can provide for the employer. If you’re in the middle of a career change, infuse the headline with your passion for the kind of job you’re seeking. The summary section at the top of your profile can be the hardest to write, but it’s also prime real estate. “That’s your billboard,” Perkins says. In addition to descriptive text, add photos or videos, and links to work samples, presentations or publications. If you’ve received recommendations from your LinkedIn network, Turnbull suggests inserting quotes from them in your summary, instead of relying on recruiters to read to the bottom of your profile, where LinkedIn slots them. The summary is also the place to showcase your personal brand, says Perkins. In the same vein, always keep your information up to date. As Roy notes, “When I conduct a search, the preview screen will list the name, current title, dates of employment, and current employer, as well as their past employer. If I see that someone has ended their current position, that just changed the candidate from a passive to an active candidate” in her tracking system.